Thomas and Atlanna spend the next few years together, and they become parents to a son, Arthur. Everything seems lovely until one day when a team of Atlantean commandos burst into their home and start to attack with the intention of taking Atlanna back to her betrothed, King Orvax. Atlanna fights back and beats the commandos down, leaving her time to get away with Thomas and Arthur. Atlanna tells Thomas she must return to Atlantis for his and Arthur's safety, but she vows to return to both of them someday. She kisses Thomas goodbye and jumps back into the ocean, leaving Arthur her trident for when he is ready to use it. Years later, we see Arthur as a child on a school field trip to the aquarium. He is seen talking to the fish, and two bullies start to taunt and mock him for it. A shark then starts banging on the glass, cracking it slightly and scaring everyone else. They watch in astonishment as all the sea creatures gather right behind Arthur, and his eyes glow yellow as he has them at his command. Twenty years later, a team of pirates led by Jesse Kane (Michael Beach) and his son David (Yahya Abdul-Mateen II) take over a submarine. After subduing the men on board, the villains find that they hit something, or rather, something hit them. It's the now adult Arthur (now played by Jason Momoa), better known by many as Aquaman, coming to the rescue. He makes his way into the sub and starts fighting the pirates, laying them all out with ease before going after the Kanes. Jesse fires an RPG at Arthur, thinking he's killed him, but Arthur picks himself up and is completely unscathed. Arthur retaliates by piercing Jesse in the chest. The sub starts to take on water, and Jesse gets pinned under an explosive. David desperately tries to free his father and pleads for Arthur's help, but he refuses to save Jesse because he and his son have killed innocent people. David continues trying to free Jesse, but he knows his time is almost up, and he pulls out a grenade before ordering David to get out and to go kill Arthur. David reluctantly listens and climbs out of the sub as he hears Jesse set off the grenade. Arthur rescues the other men while David gets away in another sub. Arthur joins Thomas as he waits on the docks for Atlanna as he has all these years. The two go to a bar where they see a news report of Aquaman's heroics, and Thomas knows it was his son. He reminds Arthur how he is meant to unite both the surface world and the kingdom of Atlantis. A group of bikers then approach Arthur, seemingly looking for a fight, but they actually just want to take pictures with him. Down in Atlantis, Arthur's half-brother Orm (Patrick Wilson) is with Arthur's mentor Nuidis Vulko (Willem Dafoe) as they prepare to meet with King Nereus of Xebel (Dolph Lundgren). 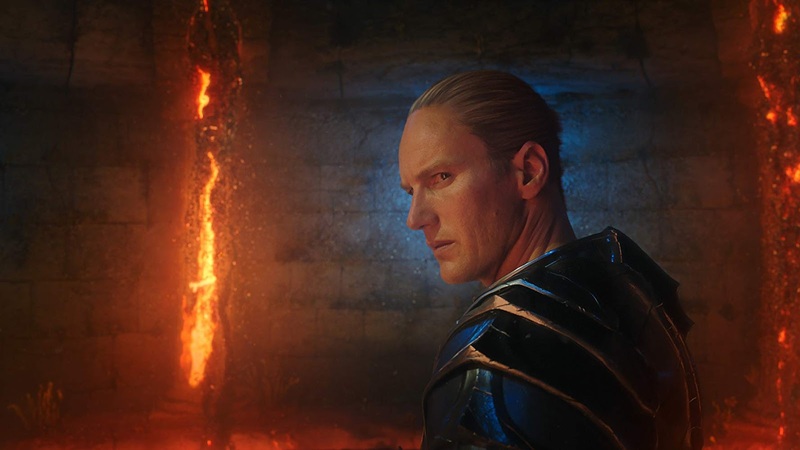 Orm wants Nereus to form an alliance with him in a supposed effort to unite the other kingdoms of the sea, but Orm really wants an excuse to attack the surface world, believing they will strike upon Atlantis first. Nereus is also aware of Arthur's existence, though Orm refuses to acknowledge his half-brother or that his mother lived among the surface dwellers. Just then, a blast hits the area, and a submarine comes in for an attack. Orm and Nereus round up their forces to strike back, and Orm manages to send the sub crashing to the lowest depths of the ocean. Nereus is then convinced to side with Orm as they prepare to send a message to the surface. Arthur and Thomas are leaving the bar when Arthur is found by Princess Mera (Amber Heard), daughter of Nereus. She warns Arthur that Orm is planning to wage war on the surface, and that the lives of people both on land and sea will be in danger. 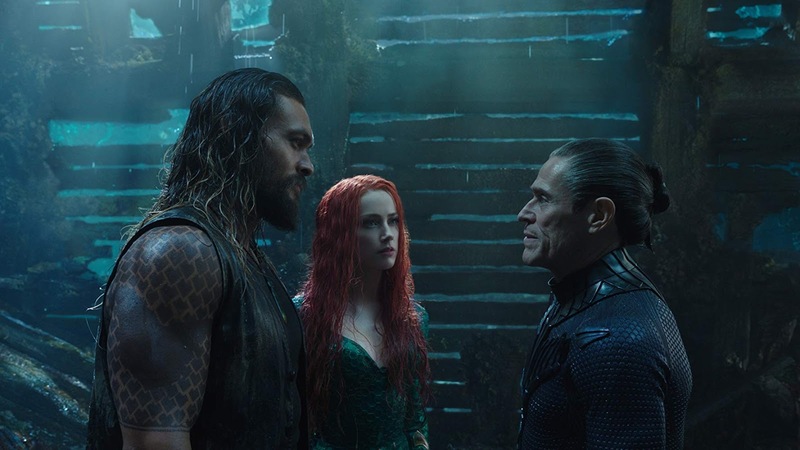 Arthur doesn't seem interested, even as Mera tells him that Vulko has found the location of the Trident of Atlan, which can be used to defeat Orm and allow Arthur to claim his place as king of Atlantis. Arthur remains unmoved, due to his belief that the Atlanteans executed his mother, but he promises to handle Orm his own way if he does attack. Orm and his commandos meet with David, as they are in cahoots and Orm had David orchestrate the submarine attack. Orm hands David his payment, but he wants to get his hands on Arthur. A massive tidal wave heads toward the mainland as Arthur and Thomas are driving home. It strikes their truck and pulls Arthur out. He frantically swims back to his father, but with Mera's help, they are able to get Thomas out of the water and revive him. Arthur looks upon the now devastated land and is convinced to join her to stop Orm. The two head toward a cliff side to dive into the ocean, which is the same place where Vulko taught Arthur how to swim with his Atlantean instincts. Arthur and Mera board her watercraft and ride past Atlantis to make it to a sunken ship to meet Vulko. He tells Arthur that the legend of Atlan's trident is real, as it belonged to the founding king Atlan (Graham McTavish) and was forged from powerful steel, designed to allow someone worthy to rule over Atlantis. Back then, Atlantis prospered on the surface and made impressive technological advancements, but their drive for power ultimately brought their downfall, and Atlantis sunk to the bottom of the ocean. However, their advancements also helped Atlanteans evolve and breathe underwater, while others regressed and mutated into monstrosities. Atlan would spend the rest of his life in exile. Vulko provides Arthur and Mera with a cylinder to find the final resting place of Atlan, just before they are attacked by a commando. Arthur and Mera fight them, but another more powerful group led by Murk (Ludi Lin) arrive and capture Arthur. Arthur is brought before Orm so that they can finally meet. He rubs in Arthur's face the fact that Atlanna was apparently executed for bearing a child from the surface, leaving Arthur with the feeling that he is to blame. Orm also explains his position and hatred for the surface world due to the harm that they have inflicted upon the oceans. He offers to let Arthur leave and never return, but Arthur challenges him to a duel. Despite objections from Vulko and Mera, Orm accepts. Arthur gears up for the duel, wielding his mother's trident. Meanwhile, Orm gives Mera, his betrothed, a bracelet that he says belonged to Atlanna. A flashback shows Vulko training him to properly use it, even showing him a move that creates a type of water shield. Young Arthur believed that Atlanna abandoned him because she didn't love him or his father, but Vulko told him that she was executed by being fed to the creatures of The Trench. In the present, Arthur heads to the Ring of Fire where the duel commences before an ecstatic crowd of people who are on Orm's side. Although Arthur puts on a respectable display of force, Orm attempts to drag him down into the lava to kill him. Arthur escapes Orm's clutches, but the evil king uses his trident to destroy Arthur's. Mera intervenes and gets Arthur out of there before Orm can strike a fatal blow. The two get away in her watercraft and are pursued by Orm's men. Their ship is shot down, but Arthur and Mera escape, although Orm is led to believe that they were killed. The two hide in the mouth of a whale that Arthur summons so that it can take them somewhere safe above the surface. Orm finds out about Arthur and Mera surviving, and he orders his commandos to find them, but Nereus forces Orm to ensure that Mera is brought back safely. Orm then goes to contact David and allows him to lead the commandos to find Arthur and Mera, and he equips David with Atlantean weaponry to ensure that Arthur is killed. David does some personal tweaking to the weapons and suit to his own liking. Arthur and Mera board a plane to take them to the Sahara desert, and they jump out with no parachutes. They walk until they fall down a hole that brings them to an old temple where Atlan's trident was forged. Mera places the cylinder down on a round platform, but nothing happens until she realizes it must be activated with water. After doing so, it activates a holographic message from Atlan with instructions on how to locate the trident. Arthur then finds a bottle with a map inside that tells them their next stop is in Sicily. Orm meets with the Fisherman King (Djimon Hounsou) in an attempt to get him to join forces, but the King refuses, and Orm kills him in front of his wife and daughter. He then orders them to have their people join him. Arthur and Mera arrive in Sicily where they briefly indulge in the activities among the surface dwellers. They find a spot among the statues of past leaders where they will know where the trident lies. Arthur figures it out by putting the bottle in the hand of a statue of Romulus, according to Atlan's message. When placed there, Arthur and Mera see the direction of the trident's location, which is in the Trench. They are then attacked by David and the commandos, and he now calls himself Black Manta. He fires a laser from his helmet at Arthur, while also using weapons that turn water into plasma blasts. Mera takes on the commandos while Arthur battles Manta. She kills off a few and finishes the rest by manipulating red wine and impaling them with it. Arthur manages to send Manta flying and accidentally blasting himself with his own laser before he falls into the ocean. Arthur and Mera head to the trident's location after she treats his wounds, and also takes a ship. He tells her how he feels responsible for David becoming his enemy after refusing to save his father, as well as his doubts that he is a worthy leader or king. Mera assures him he is wrong and that he is the bridge between man and the sea. Orm finds out that Vulko was working against him and he orders his men to imprison Vulko. As they sail through a storm, Arthur and Mera are attacked by the creatures of the Trench. They fight back, but a huge horde comes out and forces them to go underwater as the ship is destroyed. Just when it looks like they are doomed, they are pulled out of harm's way by a mysterious being who takes them to another location above the surface. To Arthur's surprise, it's Atlanna. He embraces his mother for the first time in years. He also tells her how Thomas has been waiting for her to return after all this time. 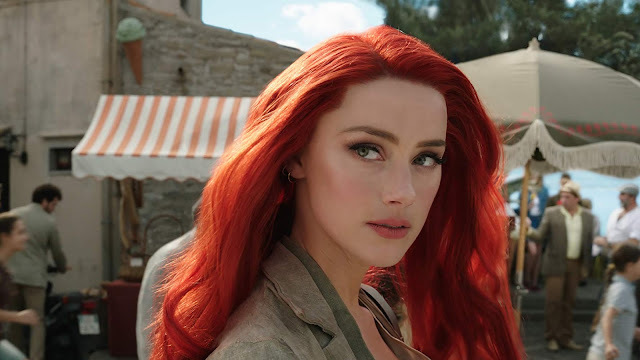 Atlanna tells Arthur and Mera how she escaped her execution and has been stranded in an uncharted sea. She points out to Arthur that the trident is located behind the waterfall, and only the one true king may enter and come out with the trident. She and Mera give Arthur confidence to head on in. Arthur enters and is faced by Karathen (Julie Andrews), a gigantic monster that guards the trident. She doubts Arthur's worth and tries to attack him, but Arthur then uses his powers to communicate with her, something that only Atlan was also able to do. When Karathen asks Arthur what makes him worthy of wielding the trident, he says he is not worthy, and that he only wants to save both worlds. Karathen is convinced and allows Arthur to pull the trident from Atlan's skeleton, giving him greater power and also a new suit. Orm, now calling himself Ocean Master, and his forces gather to launch their attack on the surface. Arthur and Mera lead their own forces of sea creatures, including Karathen, to fight back and subdue Orm's army. The creatures take out Orm's men, leading the other Atlanteans to renounce their loyalty to him. Orm then proceeds to fight Arthur once again, only this time, Arthur forces Orm to the surface to fight on his own turf. Arthur utilizes the trident's power to his advantage, and he shatters Orm's trident, leaving him on his knees. Arthur decides to spare Orm's life, even as he demands to be killed, but Atlanna rises from the ocean to greet Orm, and he goes to hug his mother. Vulko orders the commandos to arrest Orm, and he goes willingly. Arthur tells Orm that he is willing to talk to him when he is ready. The Atlanteans then accept Arthur as their new king. Thomas goes down to the docks once again, and is surprised to see that Atlanna has finally returned to him. The two embrace and kiss. Arthur concludes with a narration stating how destiny has a way of bringing people together the way it brought his parents together. He has now accepted his position as a son of the land, as a king and protector of the seas as... AQUAMAN. Midway through the credits, David is shown to be alive, and he is found by Stephen Shin (Randall Park), a conspiracy theorist obsessed with Atlantis and Aquaman. When David wakes up, he finds Stephen checking out the Atlantean tech. David offers to show Stephen how it works if he helps him find and kill Arthur/Aquaman.